We have all encountered different kinds of internet sportsbooks; some may look new with a sleek design, while others have kept the same website from when they started in 1998. We hardly ever hear of a popular site upgrading their appearance, as well as their features, but Bovada.lv has certainly done so. They just recently rolled out an entirely new layout and design for their entire website, which also includes their casino, poker, and horse racing. They have made the website so much more user-friendly, with easy navigation. Not to mention, members can find all useful information in place, the dashboard. Allows you to jump into all sporting action with ease. 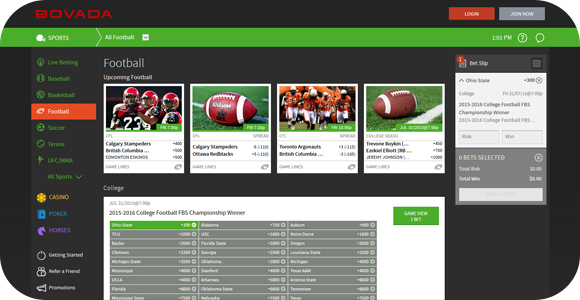 You can browse and compare different betting lines to find the best one using a list view. They have also improved upon some of their best features as well, like Live Betting and their all-purpose bet slip that will allow you to track all of your wagers. This is a great moment to be a Bovada sportsbook member, as they have their great bonuses, and with their new look, they are ready to take on any competition.